The designer’s choice, the Holiday Swag brings the best of the Cascades into your home. 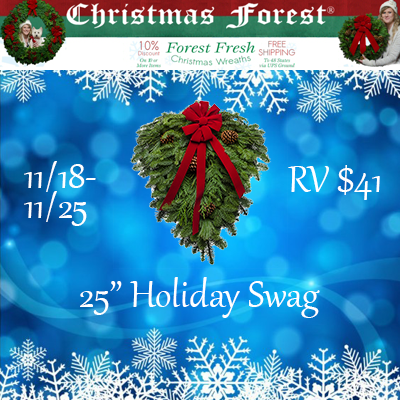 A departure from the classic Christmas wreath design, every Holiday Swag is handcrafted from the native evergreens of the Pacific Northwest, using Noble Fir, Western Red Cedar and Princess Pine. The moment you open the box you will be transported to the magical forests of the Cascades! We open up stockings on Christmas Eve as our tradition. we go to church on Christmas eve and then open one gift when we get home. We watch a movie and bake cookies for Santa. We bake cookies, watch movies, and open our christmas jammies! Open 1 present just after you get back from Church. The rest wait for the morning! it has always been our christmas eve tradition that we open presents after we have our christmas dinner. There is always one present left under the tree with no name on it, so the person who is getting the present doesn’t know till the end and everyone wonders if it is for them. Crazy I know but we enjoy doing it. Our Christmas Eve tradition is going to church services and coming home to watch movies and bake cookies. Thank you for the giveaway! We open our presents on Christmas Eve. The family always gathers together to open presents and eat dinner. Our family gathers together on Christmas Eve, decked out in pajamas and we eat gumbo and exchange gifts between each other! THE FAMILY GETS TOGETHER AT ONE OF THE HOUSES AND CELEBRATE WITH GOOD FOOD AND FAMILY AND GIFTS. THEN EVERYBODY HAS CHRISTMAS DAY TO CELEBRATE WITH THE IN LAWS AND THEIR OWN FAMILY. LOVE THE MEMORIES MADE. THANK YOU. We do a family gift with a movie, pjs and hot chocolate. yes, we attend Christmas Eve church service as a family. We have tea and cookies and open our stockings. It’s not a “tradition”, per se, but rather for God….we sometimes go to Holy Mass at Midnight….if not then, we go later on Christmas day. We go to Mass every Sunday and Holy Day. Thanks and God Bless! We get together with my cousins, aunts and uncles every Christmas Eve. It’s a nice way to spend with family and to find out what everyone has been doing for the past year. We leave really late looking for “Santa” and looking at the lights. At midnight we open one present. We like to open one of the presents we bought one another. Usually we’ll have dinner and watch a Christmas movie before going to bed. We do last minute shopping. We love to bake and decorate sugar cookies. We put out cookies and milk for Santa.